Two Pelican Rapids High School seniors have been honored for their well-rounded student careers. 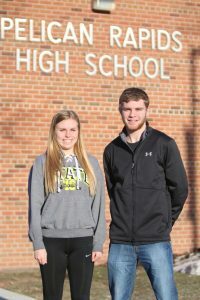 Earning AAA honors for excelling in arts, athletics and academics at Pelican Rapids High School are Kaylie Isaman and Hayden Christenson. The 2019 winners of the Athletics-Arts-Academics honors are Hayden Christenson and Kaylie Isaman. The purpose of the high school league program is to recognize and honor high school seniors who have excelled in the classroom, on the athletic field, and in the fine arts. “Triple A” Award recipients are selected through a multi­level process involving member schools of the League, the League’s administrative regions, and a special committee of educators, business leaders, and members from the fine arts and athletic communities. Nominations are limited to two qualifying students per school–one male and one female. “Another thing I am very humble about is being selected for the school’s math team. I have participated with the math team a few times and even placed as a team,” wrote Isaman in her AAA documents. As a junior, she participated in the school musical–not as an actor, but as head of the pit band. The group practiced many hours a week. As a musician, Isaman was selected for the Heart O’ Lakes honor band in the 8th grade. She was first chair in the Pelican band and third chair in the honor band. “Athletics, Arts, and Academics each have their own role to play in making you a better person, but all three share a few major contributions to shaping me. • Athletics have taught me how to be a part of a team and how to work together. This is one of the main things employers look for, so I am very grateful to have learned this through something I love to do. • The arts have taught me how to appreciate other people’s strengths. This is important for life because you become nicer, more supportive, and more understanding when you can appreciate what others can do. • Academics have taught me life skills such as communication, how to study, how to be on time, and much more. High school academics might prepare me for college, but more importantly they prepare me for life. Isaman believes that these three things together form a better person because they teach how to work hard to succeed. Isaman, who scored more than 1,000 points for the Pelican Rapids Lady Vikings basketball team, earned an academic and athletic scholarship at Dakota Wesleyan in Mitchell, South Dakota, where she will be playing basketball. In addition to a high GPA and college level courses, Christenson has earned other academic achievements–including a ranking at the very top of his Class of 2019. By taking college level classes, he earned 12 college credits in Pre-Calculus and Spanish III. Those credits will give him a jump next fall, as he plans to attend North Dakota State University in the engineering program. By the end of my senior year, he expects to have earned an additional 10 college credits. He has been enrolled in upper level math classes since 7th grade. Christenson has been on the A Honor Roll every quarter since 7th grade. His ACT score is 29, gaining a 35 on the mathematics portion. He has been a member of the High School Math Team and has attended the Tri-College Math competition every year in high school. Honors/awards include: 2nd place in region (9th/Tri-College), 2nd Team All Conference (9th/Math Team), 3rd place in region (10th/Tri-College), 4th place in region and 1st Team All-Conference (10th/Math Team), 4th place in region (11th/Tri-College). Throughout his high school career, he also participated in Knowledge Bowl. He was also chosen as a member of the Minnesota Honor Society and is currently Vice-President. During his sophomore year, he was on the Academic Team for football, basketball, and baseball; and earned the Academic All State honor for football his senior year. In the fine arts area, he has been active in band. He is currently first-chair french horn in Wind Ensemble and was also first-chair in Concert Band. He participated in the Fall Festival Honor Band in 11th and 12th grades at Minnesota State University-Moorhead. He received superior ratings at the Subsection Music Contest last year with a horn quintet and a brass quintet. In addition, Christenson received numerous awards/honors in athletic areas. In football, he has earned the following at the varsity level: Defensive Scout Player (9th), All Academic Team (11th), Academic All-District (12th), Academic All-State (12th), All-District Player (12th), All-Section Player (12th), Team MVP (12th), and Most Valuable Receiver/Back (12th). For basketball, he earned the following also at varsity level: Most Improved (11th), Best 3-Point Percentage (11th), All-Academic Team (11th), All-Tournament Team (12th). At the varsity level in baseball, he earned the following: Honorable Mention All-Conference (10th/11th) and MN State Baseball Showcase nominee (10th,/11th/12th).